Hi crafters! Those of you who are on our mailing list or follow us on Facebook may already know that sadly we will not be organising a market for Christmas 2015. This is because our usual venue, Fabrica Gallery, will be having renovation work over the festive period. We looked into alternative venues, but nothing felt quite right, so we decided that it would be best to wait until 2016 to host another market when we can be back in our usual ‘home’! We are happy to announce that we have booked the venue for 3rd & 4th December 2016! It’s a long way off, of course, but if you are not currently on a our mailing list and would like to receive information about that date when we start organising it next year, then please email us at craftaganza@gmail.com, preferably with a link to where we can see images of your work online. Thanks and see you in 2016! Application Period Closed. PLUS: New Poster Design! The application period for our Christmas 2014 event is now closed and we are currently wading through an unprecedented number of applications. Please bear with us whilst we get back to everyone. In the meantime, check out our epic Xmas poster design! Created, once again, but the phenomenally talented Silvia Sella. Christmas 2014 Seller Application Period is OPEN!!! 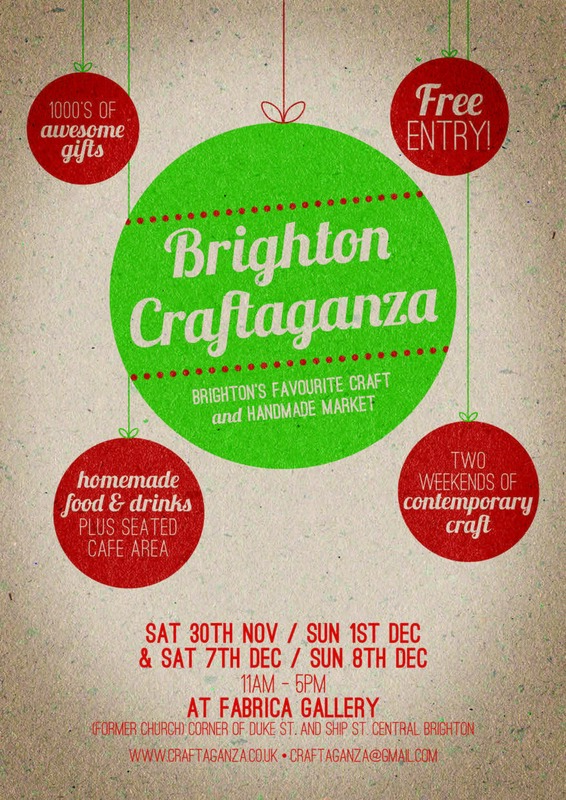 We are now accepting applications to sell at this year’s Brighton Craftaganza Christmas market. It will be taking place on Saturday 29th & Sunday 30th November at our usual awesome venue, Fabrica Gallery, in the heart of Brighton’s shopping area. For full information, terms and conditions CLICK HERE. Once you have read the information document, CLICK HERE TO APPLY. The closing date for applications is Friday 17th October. If you have any enquiries, please email us at craftaganza@gmail.com. PLEASE NOTE we are very busy organising this event and get a lot of emails at this time of year so PLEASE READ THE INFORMATION DOCUMENT FIRST as it may answer your questions. Thank you! ONE WEEK ‘TIL APPLICATIONS TIME…. Yes indeed crafters, in one week’s time we will be accepting applications for the Brighton Craftaganza Christmas craft market. This year’s event will take place on Saturday 29th & Sunday 30th November. The application period will run from Friday 5th September for six weeks until Friday 17th October. Visit back here next week for full details about the event and how to apply! 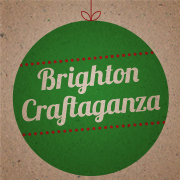 Christmas Brighton Craftaganza: APPLICATIONS NOW BEING ACCEPTED! The weather is getting nippier and it’s time to get planning for the festive selling season! 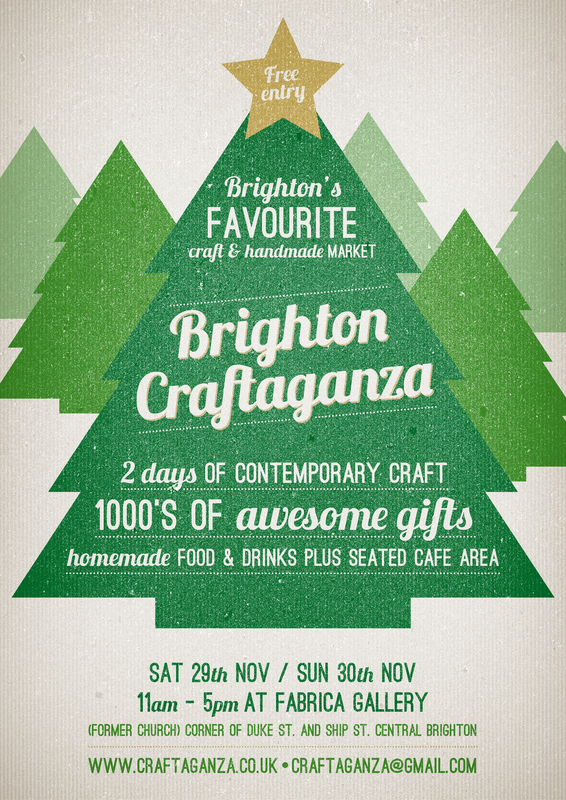 Brighton Craftaganza is back and it’s bigger and better than ever before! We are taking over our usual venue, the beautiful and atmospheric Fabric Gallery (a former Regency church) for not one but TWO weekends on the run up to Christmas. Sellers have an unprecedented array of stall options to apply for to suit your crafty business. If you are already on our sellers’ mailing list then check your inbox or spam box. However, if you are not and are interested in finding out more about the forthcoming dates then please email us at: craftaganza@gmail.com.